Just typing ‘New Beginnings’ caused a few tears. Man, the past few years have been overwhelming, difficult, tearful, great, depressing, amazing and rewarding. There have been so many changes. For one, I went through a divorce in 2013 and I also met my now husband, James. There have been so many new beginnings: healing from a divorce, a new relationship and a marriage. For my husband, his new beginning came after his open heart surgery. I can’t begin to explain the difference the surgery has made on his life – it’s almost like night and day. James has always had a GREAT sense of humor and that has not changed one bit, but his energy has increased so much. I am so proud of him. He has started working out this week and he has been so committed and devoted to regaining a healthier life. He has truly been an inspiration. He just keeps on ‘ticking.’ Ha – he has a mechanical valve, which causes a ticking sound when his heart beats. For me, my new beginning came just this year. And with the help of a friend, I have forgiven myself. Actually, this year, I have tried to forgive myself and others for all sorts of various reasons. I am so tired of being mad, angry and depressed…I want to be happy, positive and most of all, I want to enjoy life with my family and friends. With this new year of making all things positive, comes letting go of feeling sorry for myself. I urge you to try and make your life more positive. Let go of the anger. Stop holding onto grudges and just simply let go. Your soul will thank you. As far as working out this week, I completed an entire week at CrossFit. Woop – go me! My life has changed so much this year. In February, my life took a totally different direction. My marriage of almost 8 years ended. The biggest adjustment has been going about life only seeing my son every other week. Going from seeing him every single day to seeing him for 7 days at a time and then not seeing him for 7 days has been tough. I have cried and cried and cried and missed him so much, but having a child does not save a marriage. Even though it has been tough, for me, it was the best decision. So this is my life now. I’m a single mother. I work full-time. I am 5 classes away from finally having my undergraduate degree in Marketing. I manage the accounts at River Region CrossFit. I feel guilty when I don’t spend every minute possible with my son. I also feel guilty when I pick my son up from daycare, take him to the box and WOD while someone else is taking care of him. It is hard for me to totally dedicate my mind to WODing when I feel like I should be with my son. It’s tough. Through the stress, I have tried to just get through each day. My goals for my journey have not been lost and they are still there, but right now – I’m just trying to overcome the stress. So much happens to your soul when you go through a divorce and all I need is support from friends and family. I don’t need lectures or to be told what I am doing is wrong, I just need a shoulder to lean on when things get tough. I need a listening ear when I have a bad day. I need someone to tell me I am a great mother when I miss my son. I haven’t given up on my fitness. I haven’t given up on CrossFit. I haven’t given up on myself. All that being said, I do have bad days. I have days of anxiety. I have days of depression. It is there and I cannot escape it, but I also have many days of happiness. I do have someone in my life other than my son who contributes to making me feel good about myself. Our meeting was unexpected, but I do not regret it. The timing wasn’t the best, but again I wouldn’t change it…. Just a few days ago I was talking to my coach and friend, Josh, about my life. I have confided in him along the way. He doesn’t let me give up on myself and helps me remember to “keep things Fletch.” I beat myself up all the time because when I am able to WOD – I’m still scaling all my WODs. In December, it will be two years since I started the CrossFit lifestyle and I should be RXing all my WODs. Josh reminds me that my life since February has been turned upside down and I’ll get back to where I was…it will just take time. For now, I cannot make new goals. I cannot say, “this is what I’ll do next.” At this point, I can only deal with the current and present moments in my life and take it day by day, and remember each day is a new day. I completed the 21-15-9 with 135 pound deadlifts. I still can’t get a toes to bar, but I give it all I got! The hang cleans were only at 75 pounds, but after those deadlifts – it felt much heavier! Tonight’s WOD was 13.3!!! Ahhhhhh! Wall Balls are not my thing. I was able to get 139 wall balls out of the 150 with a 10 pound ball. Not the best, but I’ll take it. After all, that’s an improvement! Still here and still WODing. Well…what can I say? It has been a long time since I last posted on “i chalk it.” My apologies to my followers. I have had to deal with some personal issues and I still am unsure of how often this blog will be kept up-to-date. All that aside, I do have great news. I finally hit 40 pounds lost and slid into a size 10! We started the Ravage at RRCF and I am so proud of all the Ravagers! We are all working so hard to “activate, intensify and destroy!” Remember a few months ago, when I had a major breakdown because of handstand pushups? 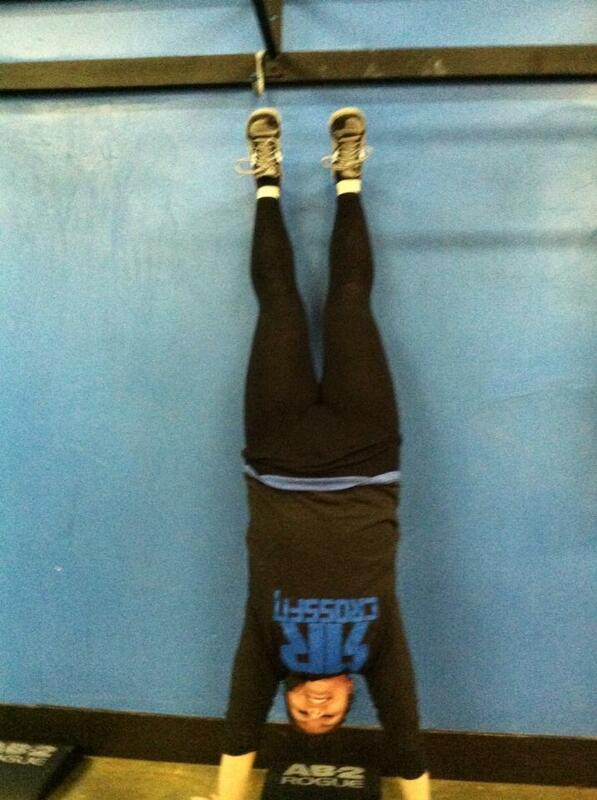 You’ll never guess who finally got their own handstand hold?!?!?! What? What? Yup, that would be Fletch. And just in case you do not believe me, check out the picture below. In addition, I am finally able to do 2 double unders in a row, but can actually link them together with a single back into a double! Oh oh oh, and I got my 1 mile to 10:10, but since then ran 1/2 mile and decreased my time to 4:49! Major improvement. And, I PR’d on my power clean this week – up to 105!! 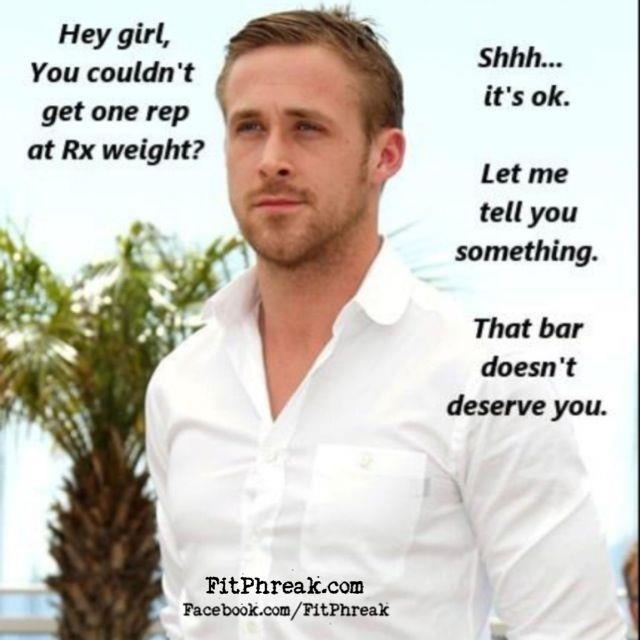 I am finally feeling like I am accomplishing goals in the box…I have even been able to WOD RX instead of scaled. It is still surreal that CrossFit stuck when most everything else didn’t…it feels good to work hard for something and actually see results. That’s all for now. Keep on keeping on! We’re a few days in the Ravage and it is awesome!!!! RRCF already feels like family, but now we’re coming even closer through motivation, inspiration and just supporting each other. Tonight was one of those nights I’ll always remember. Our WOD tonight was CrossFit Total. We maxed out on back squats, press (no push! ), and deadlifts. We worked up to find our max, but could only attempt our max three times. Once you maxed out on each movement, you totaled all three movements – which equals your CrossFit Total. There were some amazing totals tonight!!! Everyone is working so hard and giving it over 100% and it feels amazing to be a part of it! I hit some PR’s tonight! Eeeek!!! I hit 170 pounds on the back squat, 65 pounds on strict press and 205 pounds on the deadlift. It feels good to be eating right and hitting it hard at RRCF! Now to the next few months of the Ravage and beyond! 30 Day Cleanse, Shake Day No. 1. I started my 30 day cleanse today with a shake day. For the most part, it wasn’t bad. I had brief moments of hunger, but again – it wasn’t terrible. I had two meal replacement shakes today: one for breakfast and one for lunch, and a 400-600 calorie meal for dinner. I savored every single bite of my dinner! Fletch’s Stuffed Bell Peppers, Paleo Style! Man, it feels good to be in 2013. New year and a fresh start on my eating habits. From earlier posts, you know the Ravage kickoff was yesterday (Saturday, Jan. 12). I also start my 30 day cleanse tomorrow! I’m nervous, excited and anxious about the cleanse. I keep telling myself it’s only 30 days, but then again IT IS 30 DAYS!!!! To kickoff my own “Ravage” and 90 days of Paleo, I cooked my own version of stuffed bell peppers. They turned out pretty tasty and thought I’d share with y’all! Seasonings: basil, minced garlic, oregano, pepper and salt. I made my own tomato sauce, here’s what I did (I can only tell you because I didn’t measure a darn thing)! Add the chopped tomatoes to a food chopper to puree. Once “pureed”, add to a medium size pot. Season with oregano, basil, minced garlic, pepper, a little salt. Cook over medium heat until the sauce turns a dark red color. Be sure to have the sauce cooking before preparing the bell peppers and turkey. To prepare the bell peppers (prepare them while the ground turkey is cooking), cut the stem/top out. Pull as many seeds and membrane out of the peppers. Rinse the peppers until all the seeds are removed. Cut each pepper in half and remove more membrane, if needed. In a stock pot, add about 2 inches of water. Add halved bell peppers and steam over high heat until peppers are tender, but not softened. Remove bell peppers and place on pizza pan or cookie sheet. Stuff bell peppers with meat and sauce mixture. Cook in oven for about 15-20 minutes. I’ll be the first to admit that I haven’t stuck to a true Paleo lifestyle since the summer. When I first started CrossFit in December 2011, I ate Paleo and lost 30 pounds pretty quickly plus my WODs were much better. I’ve improved since last year, but I don’t believe I’ve improved at the rate I would have IF I stuck to Paleo. For the kickoff today, we started the event with a timed one mile run. I was able to complete the one mile in a little over 10 minutes, what?!?! what!?!?! I’m super excited about it, especially since I couldn’t exactly run a year ago. After the one mile run, we paired up with a team-mate and my team-mate was Cat. She is amazing! Total beast! She did Rx and I did scaled. All the stations were numbered and there were two movements per station (1 rx female, 1 scaled female, 1 rx male and 1 scaled male) with all weights preset. There was a judge at each station to log your info. You were to complete each movement per station, as many reps as possible, in one minute. The movements were: kettle bell swings, hand stand push ups, deadlifts, front squats, clean and jerks, push press, snatches, back squats, ring dips and pull ups. After all this was done, we finished our last event with a 400 meter run. Needless to say, I was exhausted after the three events! The stats recorded today will be a comparison for what we can do 90 days from now. Pretty exciting, huh? 497 Reps = CrossFit Problems. When I walked into the box and saw the 5:45 p.m. class suffering through this WOD, I seriously wanted to go home. I had to ask my coach, Josh, for a slap on the face (this is totally ok – it’s my slap of confidence). 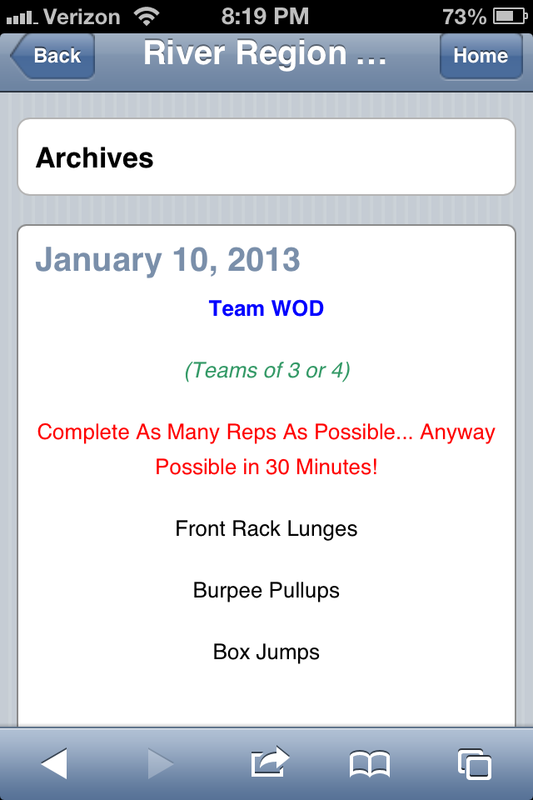 The WOD was has horrible as it looked. Our team, which we named 2 Girls and a Guy, completed 497 reps. Four hundred and ninety-seven reps, y’all! Not bad, huh?